Take the Health.com Super Bowl Fitness Challenge! Ah, the Super Bowl. A night of football, long-awaited commercial debuts, and a killer halftime show. (We heart you, Bruno Mars!) But there’s only one problem: Super Bowl Sunday is also brimming with booze, burgers, and other belly-busting foods. We've even given you a head start by rounding up how-to's for each of the moves included. Want an even bigger challenge? Add weights to the exercises, or make it a competition with friends to see who can go for the entire game. We'd love to see photos of you participating! 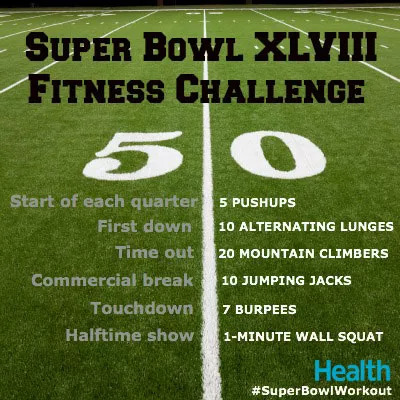 Follow along or tag your photos with the hashtag: #SuperBowlWorkout.